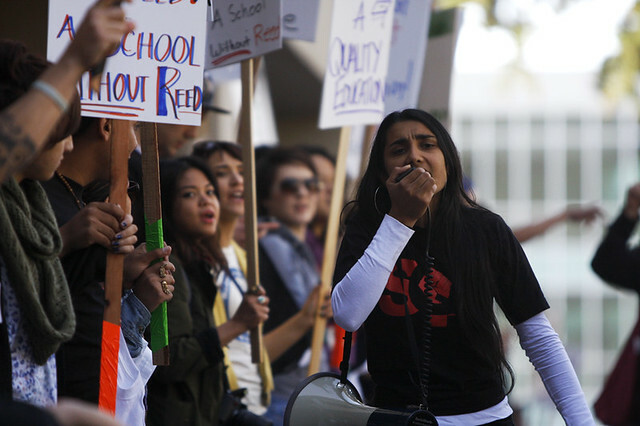 SF State student Sadaf Malik leads a chant and march at the student walkout to protest fee hikes, Nov. 15, 2011. Photo by Erik Verduzco. Update, 7:18 p.m.: All protesters have vacated the Administration building. Update, 6:53 p.m.: About eight students remain in the Administration building after it has been closed for nearly an hour. The protesters have been trying to negotiate a meeting time with President Robert A. Corrigan with Joseph Greenwell, associate dean of students. Update, 4:27 p.m.: Administration building is still operational, but some offices have locked their doors and others have sent their staff home, according to University spokeswoman Ellen Griffin. Update, 4:09 p.m.: Few offices in the Administration building remain open as 100 protesters are still hosting a sit-in, in the lobby. Office workers were told at approximately 3:30 p.m. that they had 10 minutes to leave the building. The demonstrators originally intended to speak with President Robert A. Corrigan, but he is not currently at the campus. He is in Long Beach for a CSU Board of Trustees meeting in which the new 2012-2013 budget proposal will be voted upon. Students gathered in and around the administration building for a sit-in, in an attempt to get access to President Robert A. Corrigan’s office as part of a walkout taking place today. 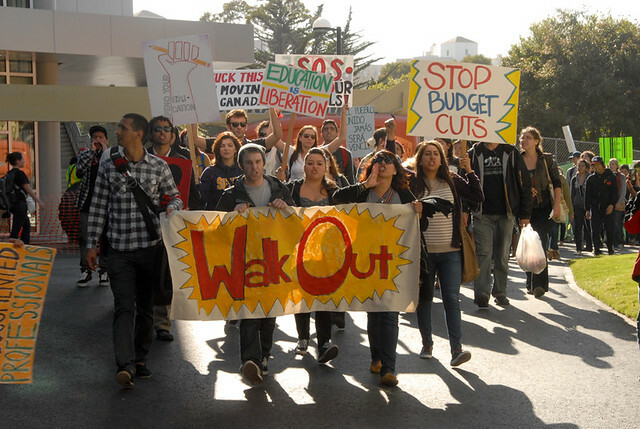 The walkout was in part organized by Students for Quality Education, Occupy SFSU, Equal Opportunity Provider and the Black Student Union in an attempt to call attention to the cuts to higher education and possible fee hikes. When students reached the fifth floor of the building, where the president’s office is located, they found the door was locked and some began pounding on the door, demanding access, before the group began heading back downstairs to the lobby. Approximately 300 SF State students and faculty members were gathered at Malcolm X Plaza at 11 a.m. for a rally, chanting and waving signs. They briefly marched to the front of the administration building where they created a circle and joined hands at 12:30 p.m. before returning to the plaza. Sadaf Malik is the senior intern for the SQE. She was amazed by the student turn out and that everyone was willing to hold hands as a symbol of solidarity. A crowd of students and faculty began gathering for the rally at Malcolm X Plaza around noon where they listened to teachers and students speak out about why the education system is a problem. SF State junior, Evans Rivera-Owings got up on stage to preform a rap he wrote about the problem he has with the education administrators. He was a member of the SQE in past semesters and has seen how the events they put on have grown. 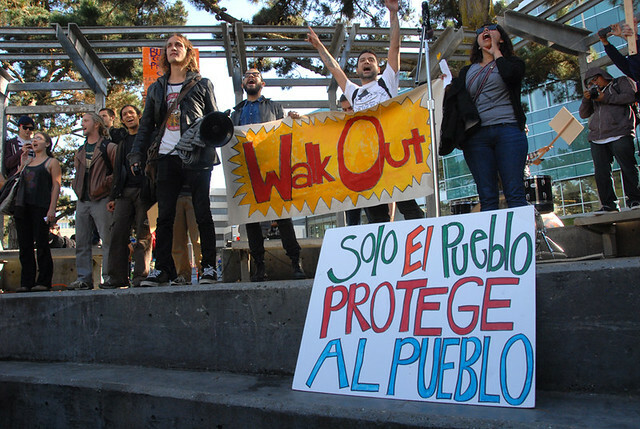 “The movement overall has gained momentum, because the whole SQE ties into the same thing that the occupiers on Wall Street and Oakland are fighting for,” Rivera-Owings said. At approximately 1:30 p.m. the crowd moved on from Malcolm X Plaza and marched on the west end of campus, stopping in front of the humanities building and calling for others to join the march. The march continued through the walkway between the fine and creative arts building before it temporarily rallied at Malcolm X Plaza again. After about five minutes, the protesters moved on the administration building where they are currently lobbying. 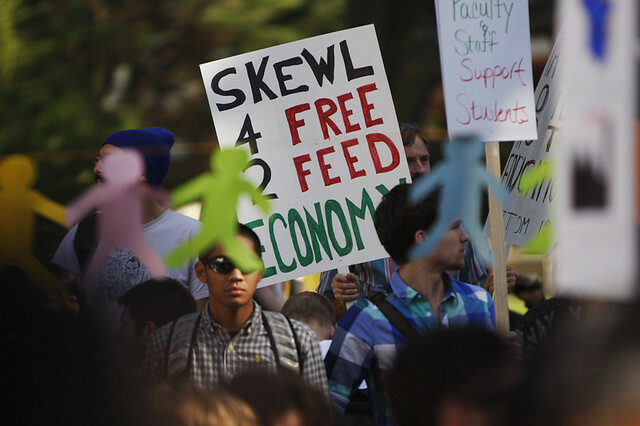 At least 200 students gathered at Malcolm X Plaza early on in the day to participate in a walkout event to protest fee hikes, Nov. 15, 2011. Photo by Erik Verduzco. 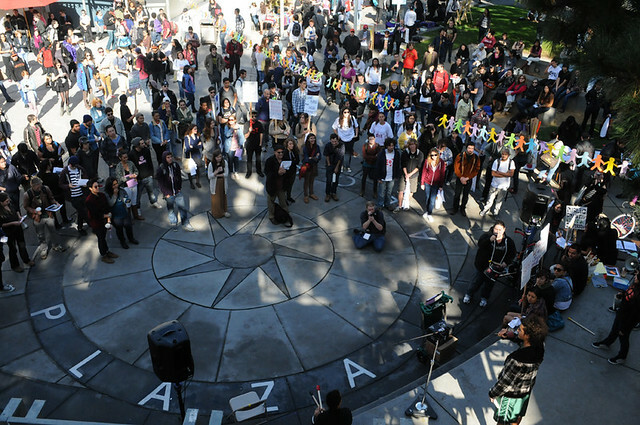 At least 300 students gather at Malcolm X Plaza to participate in a walkout event to protest fee hikes, Nov. 15, 2011. Photo by Erik Verduzco. 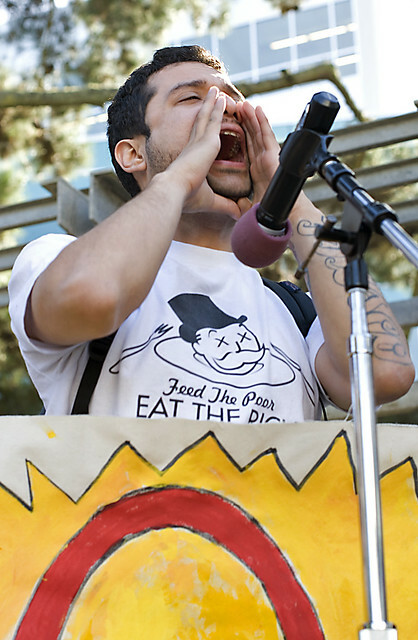 SF State student Xavier Galindo, 29, rallies up fellow students that participated in the the university-wide walkout at Malcolm X Plaza, Tuesday, Nov. 15, 2011. Photo by Godofredo Vasquez. 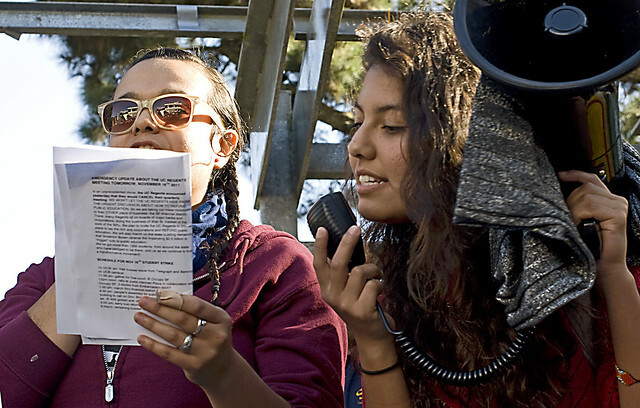 SF State student Brenda Montaño, 21, right, gets ready to speak in front of fellow students participating in the university-wide walkout at Malcolm X Plaza Tuesday, Nov. 15, 2011. Photo by Godofredo Vasquez. 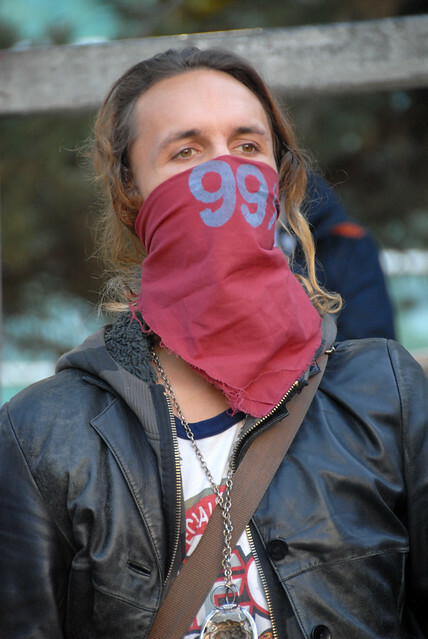 Leo Ritz-Barr, 21, wears a "99 percent" bandana in solidarity to the Occupy movements and participated in SF State's walkout Tuesday, Nov. 15, 2011. Photo by Godofredo Vasquez. SF State student Naseer Ahmed, 25, joined the marching walkout and grabbed a megaphone to try to encourage others to do the same Tuesday, Nov. 15, 2011. Photo by Godofredo Vasquez. Hundreds of SF State students walked out of their classes and marched to the Administration building during a university-wide walkout Tuesday, Nov. 15, 2011. Photo by Godofredo Vasquez. 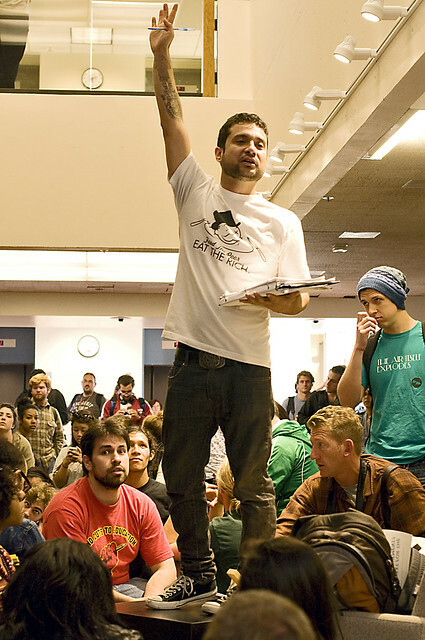 Xavier Galindo, 29, takes a headcount of how many fellow students would like to speak to the crowd during a sit-in inside the Administration building Tuesday, Nov. 15, 2011. Photo by Godofredo Vasquez. 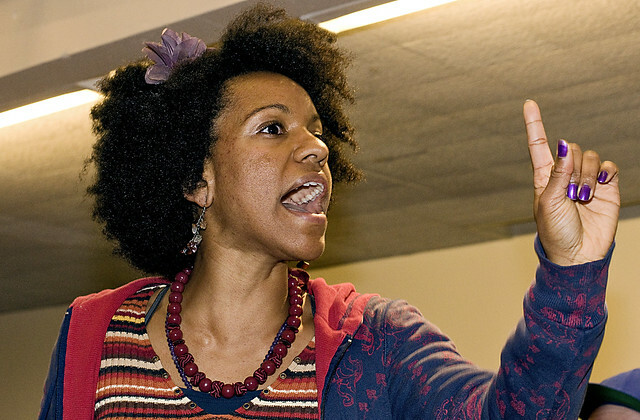 Jazz Vassar, 25, talks to fellow students during the sit-in inside the Administration building Tuesday, Nov. 15, 2011. Photo by Godofredo Vasquez. 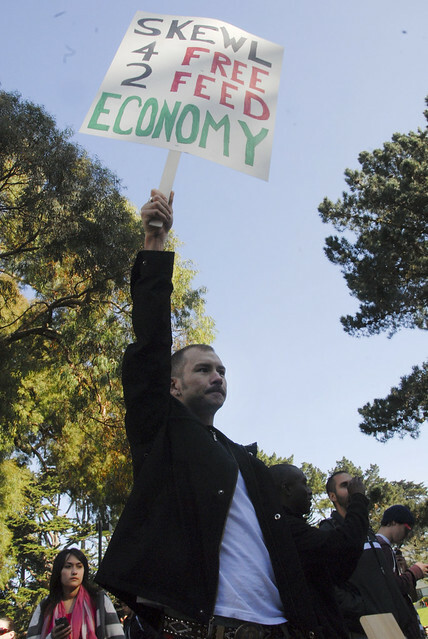 I would like to make it clear that the cooperation between SQE and Occupy SFSU was NON-EXISTANT. 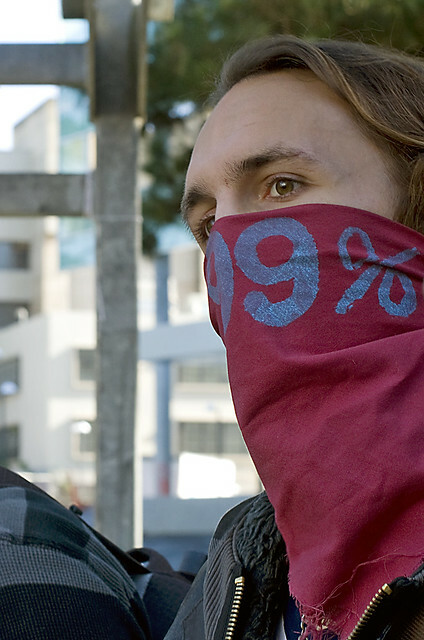 Around the time that the Occupy group was to take stage, SQE had originally planned to allow the Occupy group to use their equipment as a sign of solidarity. When the time arrived to speak up, they backed out of their agreement and took away their equipment. SQE had also left the protest and did not return until Occupy SFSU had taken over the administration building. This article is making it appear that SQE had a hand in all of the actions today, but in reality, they were only involved in less than half of it (up till 1:00 PM when they agreed they would let Occupy SFSU hold their demonstration), with the remainder of the demonstration being democratically held by the student body in a general assembly at the administration building. that guy naseer, 8th picture, is 45 not 25, and he doesn’t even go to school!!! Thank you for the clarification, Adan. I would only like to add to it for the sake of providing SF State with even further clarity as to what actually occurred. 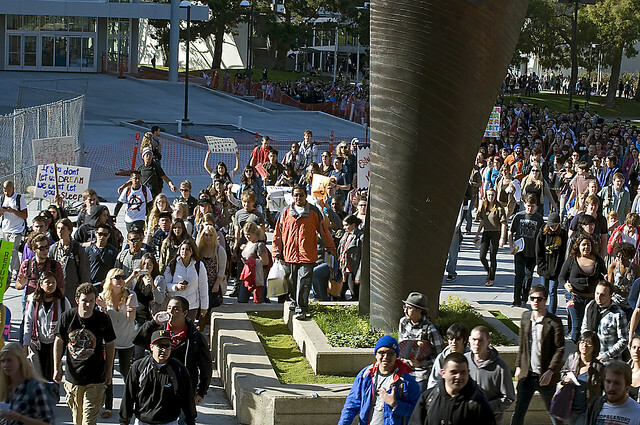 At the beginning of the month, both SQE and Occupy SFSU planned events for Nov.15 that were set to start at noon. Rather then “working against their fellow students” (as some have said), Occupy SFSU moved the planned time for their walk out to 1 p.m. The week before the event, Sadaf Malik attended a Thursday General Assembly to inform the group as to what S.Q.E was planning for the day. 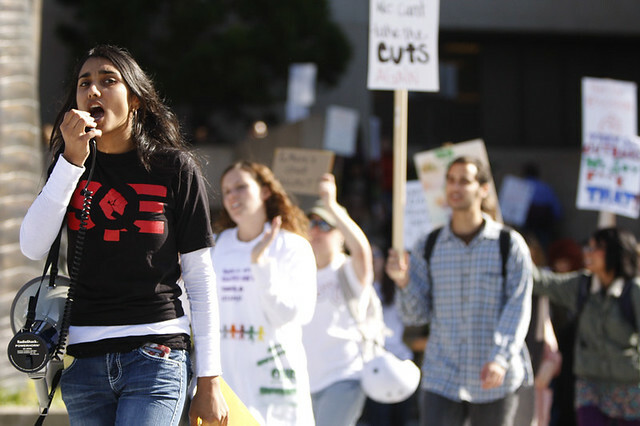 The two groups realized that their separate events WOULD NOT conflict and that SQE would be off the stage by one, allowing Occupy SFSU’s rally for a walk out to commence. In fact, the plan was for SQE to JOIN the march around the campus. Malik also said that Occupy SFSU would be able to use their microphone and sound system for their rally since “it was already going to be there [on stage].” For another point of clarity, SQE’s Nov.15 event was planned to have a series of workshops/events (t-shirt making, bands) and end it with holding hands around the building. 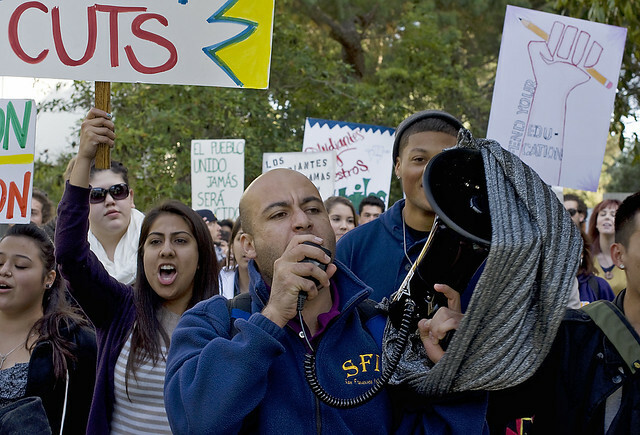 Occupy SFSU planned the walk-out, the rally AND the sit-in at the administration building. On the day of the events, SQE informed members of Occupy SFSU that their event was going to run 15 minutes into theirs and that they were not allowed to use their sound system after all. Members of Occupy tried to cooperate with the group, stating that them not following through with their agreements could lead to confusion and a division between students and organizers. They said that the events were divided from the beginning, that they would not work with Occupy SFSU and that it was up to Occupy SFSU to “figure it out”. Students began to gather for the walk out separately on the lawn outside of Malcolm X. At 12:55, the group began to chant and then went into the crowd gathered at the plaza. Members of Occupy SFSU then took the stage at 1 pm, the time that the two groups had settled on. SQE took away their sound systems, their decorations and their signs from people who were still in the crowd. And to address Rivera-Owings comment of the group, members of SQE stated that their event was SOLELY focused on the cuts to educations and NOT “the banks” or the “government” or “whatever”. This was said by a SQE member who wished to NOT be associated with Occupy SFSU. The actions of SQE on the day of the event is something that Occupy SFSU did not foresee. We are all students. We are all enraged by the ridiculous fee hikes and cuts our university, as well as the universities throughout this entire state, continues to face semester after semester after semester. WHY DIVIDE US? WHY CREATE AN UNNECESSARY DRAMA? There is no way we will defeat the injustices being thrown at us if we do not unite. 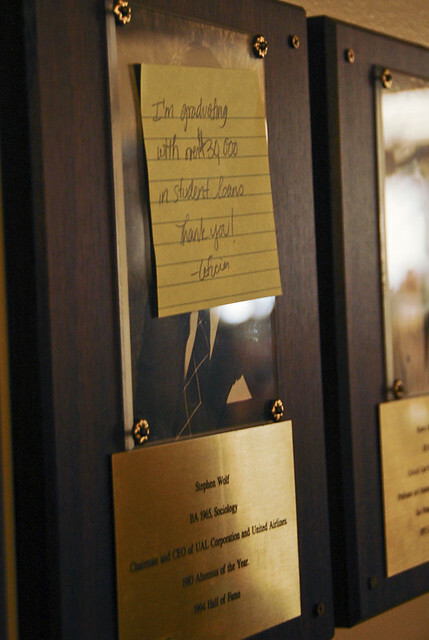 WHERE IS OUR STOLEN STACK OF BLANK I.O.U’S?